Originally posted 5/24/14, updated 5/25/14 and 5/26/14 – J. J. Timphony won the Mt. Wilson Trail Race today with an unofficial time of 1:00:12. 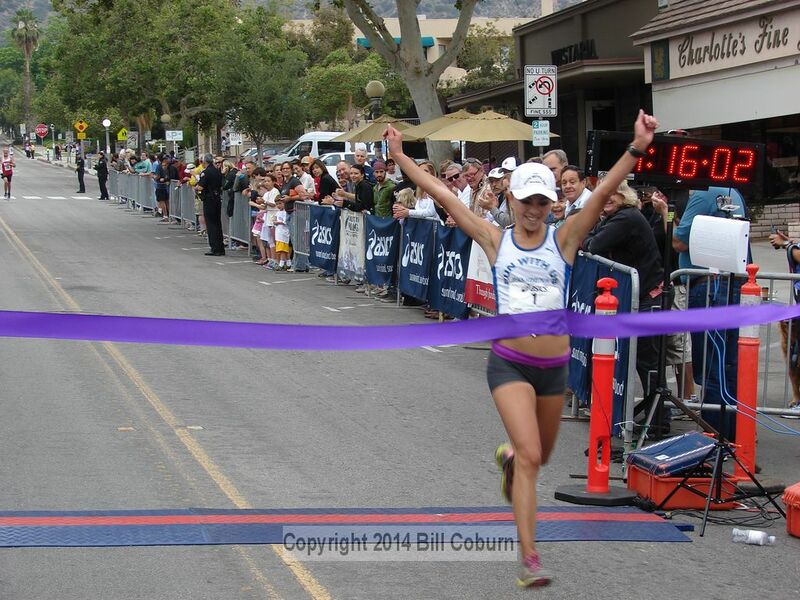 First place among the women went to the 2013 winner, Mireya Vargas, with an unofficial time of 1:16:02. Timphony also won the race in 2008 and 2009. Second place among the men went to Jon Clark, the 2012 winner who also placed second last year. Clark’s 2014 time was 1:02:25. Third place went to Victor Martinez, with a time of 1:04:27. Second and third place in the women’s division went to Emily Farr (1:19:03) and Katelyn Breitschwerdt with a time of 1:19:32. Unfortunately, my camera was in the wrong mode when JJ came across the finish line, and I didn’t get a decent picture of him crossing the line, instead all I have to offer is an animated gif, which you see below. By the time Mireya came across the line, I had corrected camera mode, and you can see the shot of her below. The race began when the horn was sounded by Gary Hilliard, who has served as Logistics Chair for the committee for many years. Hilliard sounded the horn following the presentation of the colors by Sierra Madre’s Harry L. Embree Post 3208 VFW, and the national anthem, sung by 11-year old Kaiya Wilson. Once the adults had gone up the hill, the Kids Fun Run took place, with two divisions, ages 3 to 6 (Kersting Court to Highland and back), and 7 to 12 (Kersting Court to Mira Monte and back. Thanks to co-sponsors CATZ and the Sierra Madre Community Foundation, all runners received a ribbon for their efforts, and the first 250 to enter received a free t-shirt sporting the design by the winner of a design contest held in the local schools, won by Peyton Thomas, a second grader at Sierra Madre Elementary School, for her entry titled “Kids Rinning in Mt. Wilson Trail. This year’s race was run by 317 runners. Click on a link below for photos and videos from this year’s race.